Well how pretty is this?! Sometimes a little bit (ok a lot) of pink is just what the doctor ordered and this wedding is just filled to the brim with the pretty shade. It’s also filled to the brim with personalised decor and details that meant a lot to Lisa and Nick – I’ll let Lisa tell you all about those. Her write up really made me smile, it’s bubbly and fun and made me feel as if I was hearing all about her big day in person, rather than reading it on a computer screen. 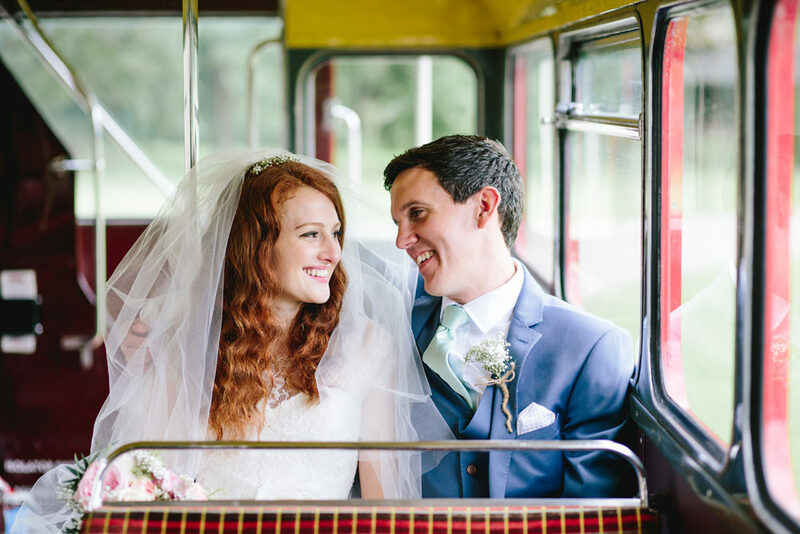 Lisa The Bride: I LOVED planning the wedding, someone at the start told me to forget tradition or what you ‘should’ do and do whatever you want – it’s good advice! When Nick and I started planning our wedding, we talked about what was most important to us and our aim was to throw the best party for all of our family and friends, and we succeeded! My advice would be to remember that you are planning one day – try not to get stressed about it and enjoy the build up as much as the day itself! I loved wedding blogs (Rock My Wedding was my favourite!) as they provided great inspiration from real weddings. 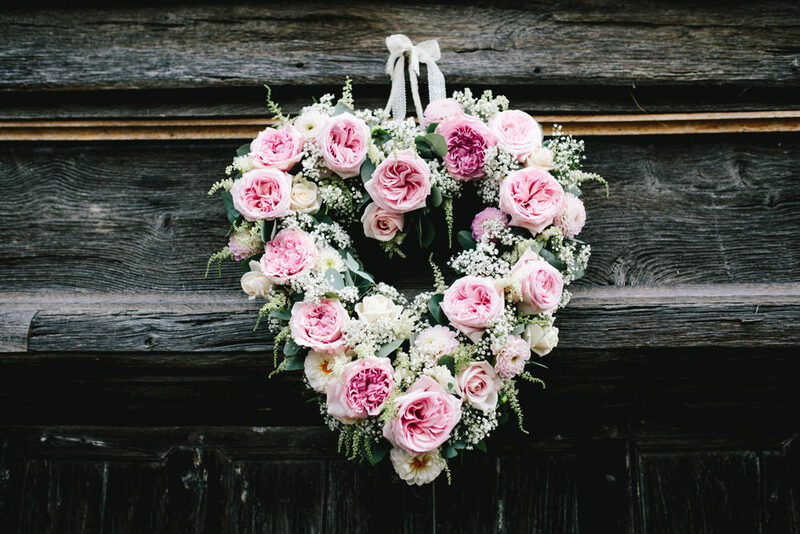 It’s important to remember that a lot of the Pinterest photos you see are from styled shoots – where whole teams, with a big budget, have created the scene so they’re not always very realistic for a real wedding with a budget. I absolutely loved looking through wedding magazines at all the beautiful dresses, I knew I wanted lace and had imagined something with long lace sleeves. I felt a lot of pressure to find the ‘perfect’ dress and on my first visit to a dress shop hated every lace dress I tried on, which was so disheartening! 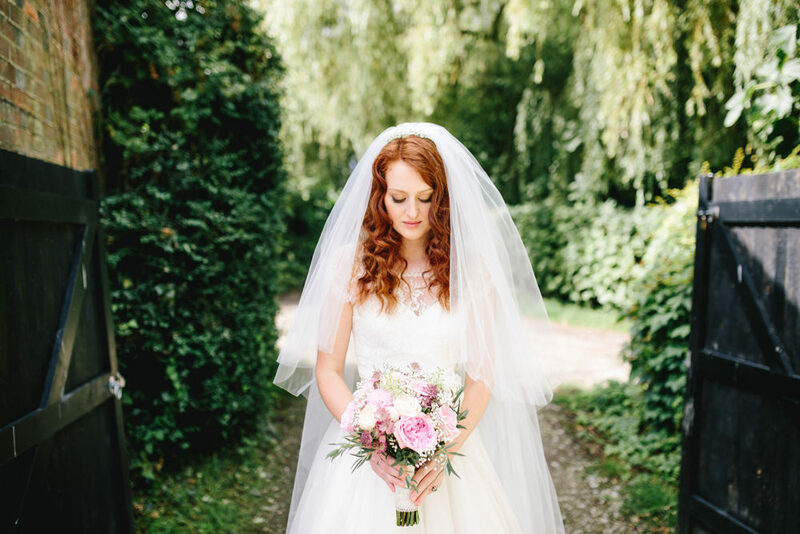 I kept looking and learnt there are so many different types of dress, hundreds of different types of lace – it was all about finding the right ones. I wanted something a little different but in the end my dress was fairly traditional but as with my usual style it was a bit mix and match! I wore a Lyn Ashworth strapless dress with a Naomi Neoh lace jacket and flower. I got them in a sample sale and would definitely recommend looking at samples for any brides who want great quality but can’t afford the £3k price tag! My dad passed away just before I got engaged, so I had a heart cut from an old blue shirt of his sown into my dress for my something blue, I wore my sisters cathedral length veil for my something borrowed, my engagement ring was my something old (it’s 1950s) and my new was my new dress! As a wedding present Nick bought some converse which my extremely talented friend Sophie Harriott (missharriott@hotmail.co.uk) then decorated. I absolutely loved them and wish I could wear them every day! It was also great to change out of my heels so I could dance all night! From the beginning Nick knew he didn’t want to wear a morning suit. Despite our incredible venue, we wanted a low key and relaxed day and he knew he wouldn’t be comfortable in anything too formal! After trawling the high street for an affordable suit, he eventually stumbled across some last season (i.e. heavily discounted!) French Connection suits. They were perfect and all the guys were really comfortable in them. 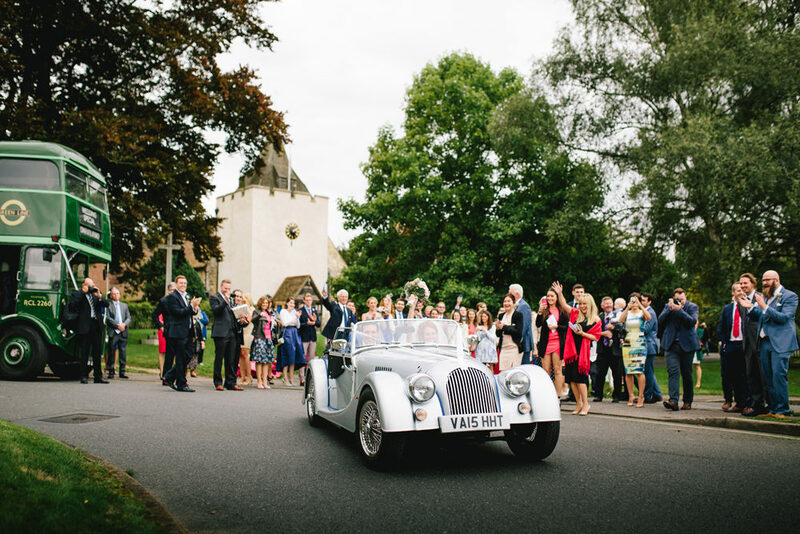 We knew we wanted to have the ceremony in the beautiful St Bartholomew’s Church in Otford, Kent. 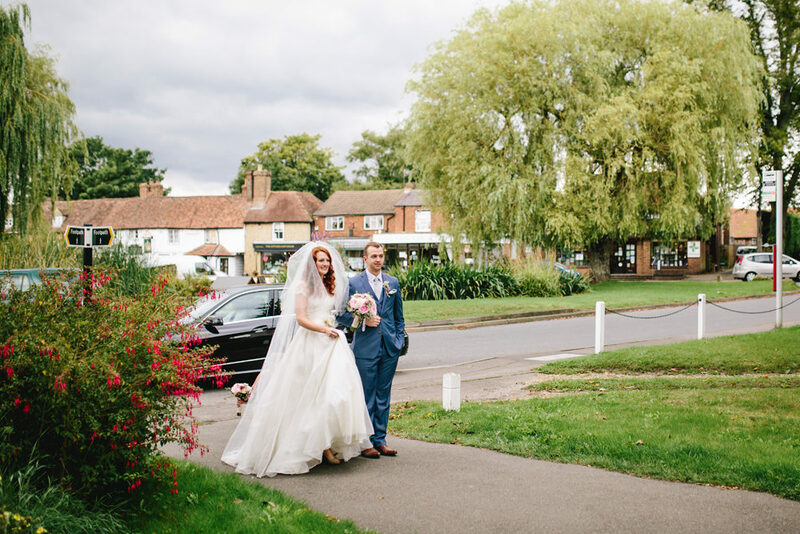 I grew up in the village and we held my father’s funeral there, so it was really special to both of us that we got married there by the same lovely vicar, Rev. Richard Worssam. However, we found there was a distinct lack of interesting and relaxed venues nearby. In an ideal world we wanted a tipi in a garden but neither of us had a big enough garden for a wedding, and it turns out hiring gardens are very expensive! We looked around and in the end went to visit Chiddingstone Castle for a wedding fair; I had always fantasised about getting married there and completely fell in love with it! We loved the orangery and stunning backdrop, and the fact the marquee was ours to decorate as we wished. It was also great to move into the castle for the evening, the space was great and it was a nice for the guests to have a change of scenery for the evening. 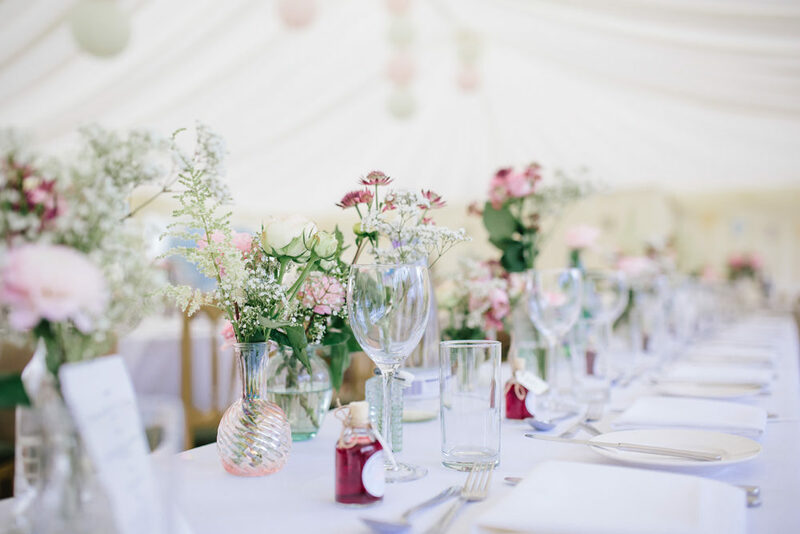 One thing I would recommend is to have a meeting with your venue manager a month or so before the wedding, we had one but it was 9 months before the wedding…way before we were into the nitty gritty of decorations, suppliers access etc. which led to a fairly stressful couple of days beforehand. We didn’t really have a colour scheme; the theme I was going for was a country garden party – something pretty, chilled out and fun. 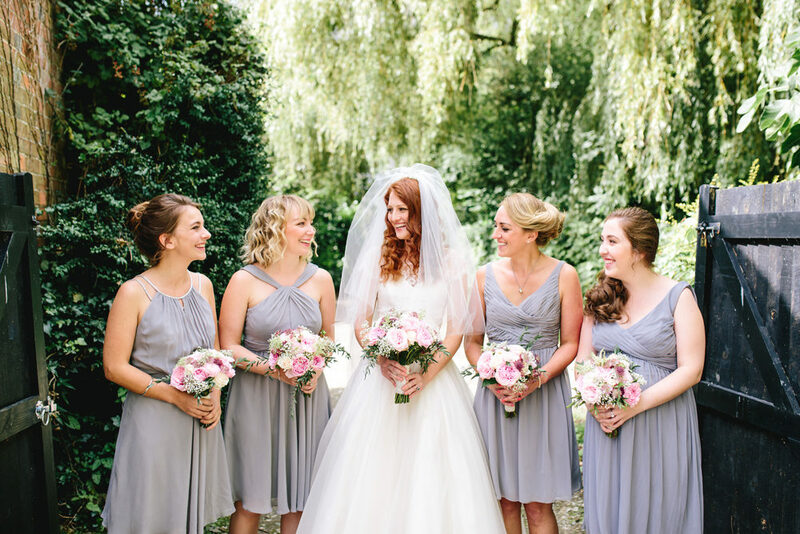 I went for grey bridesmaids dresses which we had loads of compliments on, and paired perfectly with the dusky pink, white and green flowers. The castle didn’t need any decoration at all, we just added hanging fairy lights to make the most of the lovely high ceiling and minstrel’s gallery. In the marquee and gardens it was great to have a completely blank space to work with. 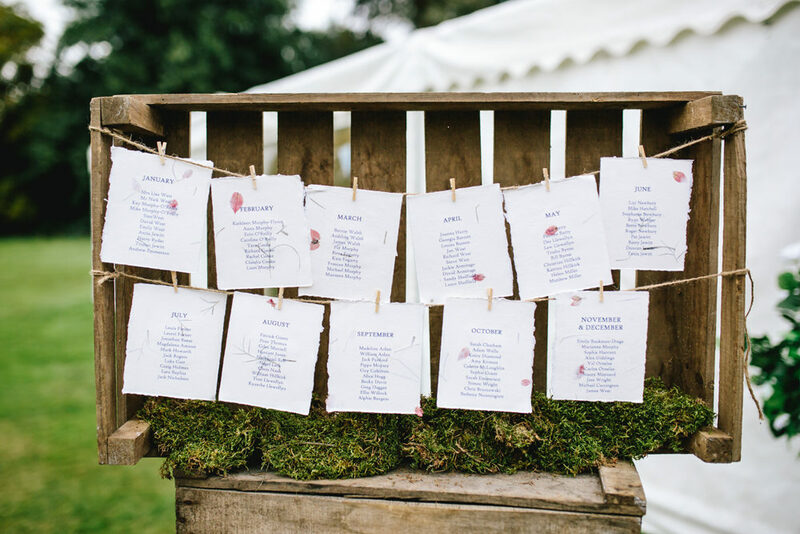 I knew I wanted lots of flowers with a rustic theme, so we had the crates to display the seating plan, hessian table runners and good old bunting! I bought really cheap hanging lanterns online which looked fantastic in the marquee and then our flowers really finished it all off. The hessian table runners (handmade with cheap builders hessian by my mum, Nick and I!) and cheap terracotta pots that I had distressed with white paint, stuffed with carrier bags and topped with fresh moss and candles. I’m Irish so we had lots of family members coming over for the day, so we created a little Guinness Bar for the drinks reception, which went down very well! Our flowers!!! Where do I start…they were absolutely amazing and the star of the day – everyone was talking about how beautiful they were! 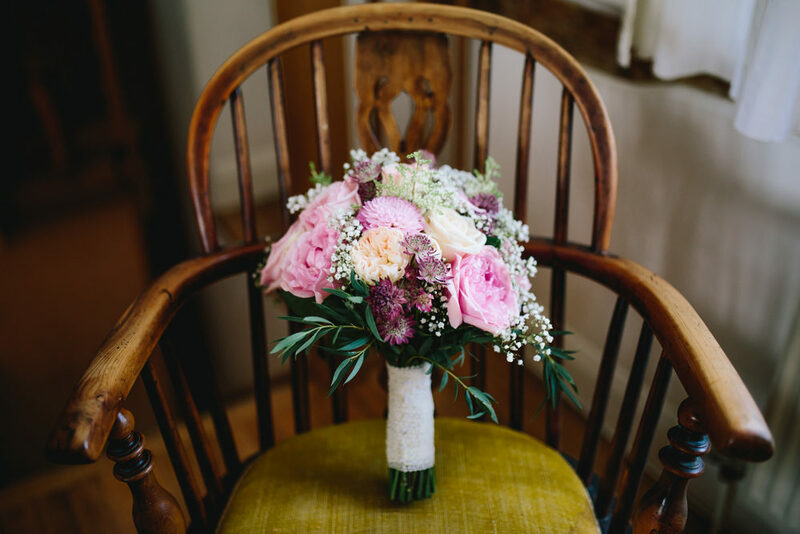 I was lucky enough to have the incredible Lizi Newbury from Wheal Sara Flowers in Cornwall. She is an old family friend (her sister Stephanie was a bridesmaid and is my oldest friend!) and said she would do my flowers for me. After a visit to Chiddingstone Castle and a chat in the pub over Pinterest, I left everything in her hands. The church was FULL of flowers, it looked and smelled beautiful and the marquee was the same. My mother in law had been collecting mini vases and jars, which were filled with mixed flowers and sat around jugs of pink hydrangeas on the table. Lizi also made me a giant heart made out of flowers as a tribute to my dad. 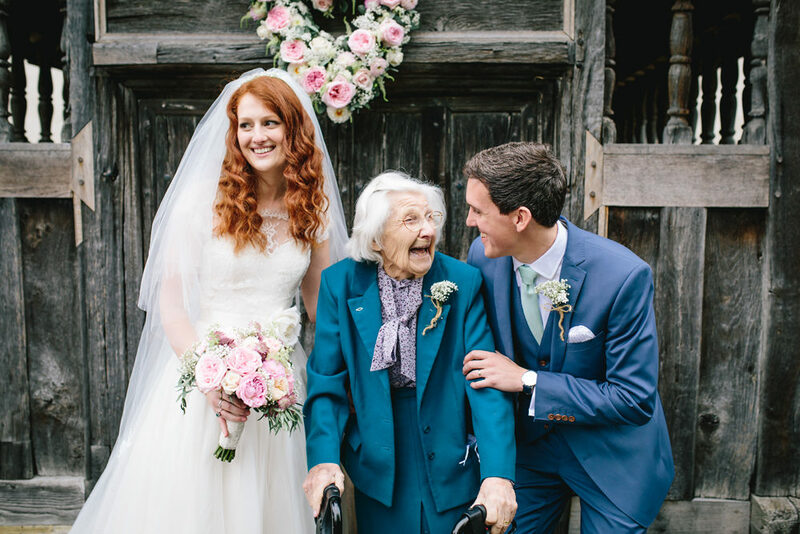 She hung it outside the church so my brother and I could see it and think of him as we walked in and then above Nick and I at the top table – to everyone else it was just a beautiful decoration but it was lovely that it had an extra special meaning for me. Bridesmaids dresses were by far the most difficult and stressful part of planning the wedding, which is ridiculous! But trying to please four very different girls, who live around the country, while trying to fit in with your own theme and budget was no easy feat! I felt like I had looked at every single dress on the internet before a friend recommended David’s Bridal in Stratford and it was a lifesaver! You really have to look but they have so many different styles in every single colour so it was great that the girls could all choose their own dresses to suit their own style. My nephew was in a gorgeous little suit from Mamas and Papas and the ushers in the same suit as Nick with grey spotty ties to match the bridesmaids. The ceremony was amazing, so many people commented to us afterwards that it was one of the most personal and fun ceremonies they had been to. Nick’s sister Emily read Song of Solomon. My brother in law read Dr Seuss’ Oh the Places You’ll Go! which was brilliant – and no easy feat to read! And Nick’s mother wrote and read the prayers so it was a real family affair. We also had a Unity candle; our mums lit two smaller candles at the start of the ceremony and then at the end Nick and I used those two candles to light one bigger one – to symbolize our two families coming together. It was our vicar’s idea and something I had never come across before, but it was a lovely idea. Abigail King sung How Long Will I Love You and Yours during signing of the register, which was really beautiful and kept everyone entertained. We wanted to keep an Irish theme throughout the day, so we had Licence to Ceilidh – a two piece Irish band who played in our drinks ceremony – much more fun than a string quartet! Our band for the evening was The Kicks and they were absolutely incredible. They played ‘One Day Like This’ by Elbow for our first dance, which was amazing, and after that the dance floor was full for the entire evening. 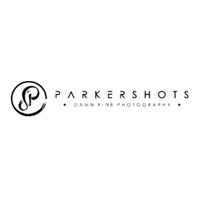 I cannot recommend them enough – if you’re planning a wedding then book them immediately! Nick and I used to work together in a restaurant when we first started going out and we both absolutely love food, so it was really important to us that we had great food at the wedding. Kathleen Bouverie from Vine Events was fantastic from start to finish – everything looked so good we found it hard to choose our menu! The food was delicious and quite a few people said it wasn’t just one of the best meals they’d had at a wedding, but one of the best meals they’d EVER had – what a compliment to Vine Events! Nick and I both love cheese so we had a cheese tower instead of a traditional wedding cake. I work in television so I knew I was going to be fussy when it came to choosing a photographer. We met with a few but found they were either extortionately expensive or not very creative. I came across Nick online and instantly loved his style. We met up and got on with him instantly, he was laid back and friendly – just what we were looking for! He was brilliant, a pre-wedding shoot put us both at ease (I hated every minute at the start!) and on the day I didn’t even notice him – the true sign of a great wedding photographer. Our day was relaxed, with a fun and lively atmosphere centered around our family and friends and Nick captured that wonderfully – I really can’t thank or recommend him enough! Great blog Fern! I often play there with The Bears Wedding Band and am amazed how much care and attention they put into each occasion!